The California attorney general’s office on Wednesday sued Fannie Mae and Freddie Mac over actions by the mortgage finance companies that have derailed a popular financing program that allows homeowners to pay for energy efficiency improvements through a surcharge on their property taxes. This month, the Federal Housing Finance Agency, which oversees Fannie and Freddie, issued guidelines to lenders that restricted the ability of homeowners to participate in the financing programs, called Property Assessed Clean Energy, or PACE. Twenty-two states have authorized the programs, which have drawn $150 million in stimulus funding support from the Obama administration. When a city or state pays for energy efficiency upgrades through the program, a lien is placed on the home. The liens, like other property tax assessments, take priority over the mortgage if the homeowner defaults. The housing agency instructed lenders that they could not accept such PACE liens. In recent months, some banks have declined to refinance mortgages for homes that carry the liens. In the lawsuit, filed in United States District Court in Oakland, Calif., Jerry Brown, the California attorney general and Democratic candidate for governor, asked that the court declare that participation in PACE programs does not violate the standards of Fannie and Freddie, which are government chartered. The suit also asks that an injunction be issued to prevent them from taking action against homeowners whose properties have PACE liens. The Federal Housing Finance Agency was also named as a defendant. “The actions of these government-sponsored, shareholder-owned private corporations have placed California’s PACE programs – and the hundreds of millions of dollars in federal stimulus money supporting them – at immediate risk while benefiting their own pecuniary interests,” the suit states. The federal agency that oversees two government-chartered mortgage finance companies imposed new restrictions Tuesday on homeowners’ ability to take advantage of a program that allows them to repay the cost of installing solar panels and other energy improvements through an annual surcharge on their property taxes. The new guidelines could also make it more difficult for homeowners to obtain mortgages even if they don’t participate in the programs, called Property Assessed Clean Energy, or PACE, but happen to live in an area where they are offered. “For all intents and purposes, until cooler heads prevail or Congress acts, it’s very difficult to envision PACE going forward,” said Cisco DeVries, president of Renewable Funding, a company in Oakland, Calif., that creates and administers the programs for local governments. In issuing the guidance to Fannie Mae and Freddie Mac, which buy and resell most mortgages, the Federal Housing Finance Agency was critical of the energy efficiency programs that have been authorized by 22 states and that have drawn $150 million in stimulus funding support from the Obama administration. 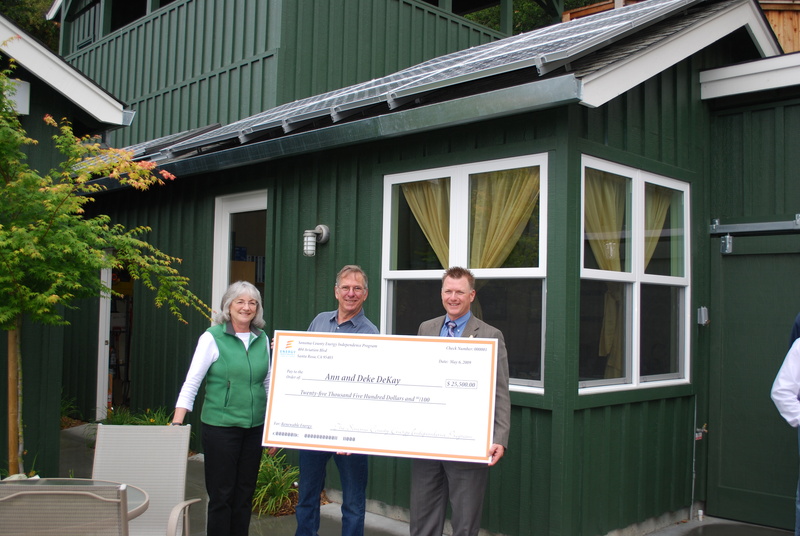 When a municipality pays for energy efficiency upgrades through the program, a lien is placed on the home. The liens, like other property tax assessments, take priority over the mortgage if the homeowner defaults. But the housing agency on Tuesday characterized PACE liens as different from other special assessments that cities routinely use to finance sewers, sidewalks and other civic improvements. “They present significant risk to lenders and secondary market entities, may alter valuations for mortgage-backed securities and are not essential for successful programs to spur energy conservation,” the agency wrote. The Federal Housing Finance Agency said efforts were continuing to develop underwriting standards for energy efficiency programs. “However, first liens that disrupt a fragile housing finance market and longstanding lending priorities, the absence of robust underwriting standards to protect homeowners and the lack of energy retrofit standards to assist homeowners, appraisers, inspectors and lenders determine the value of retrofit products combine to raise safety and soundness concerns,” the agency stated. Two government-chartered mortgage finance companies are unlikely to accept loans on homes that are part of a special program that lets homeowners repay the cost of energy improvements through a surcharge on their property tax bills, according to Energy Department officials. The Obama administration has allocated $150 million in stimulus money to support the financing technique, called Property Assessed Clean Energy, or PACE, and 22 states have authorized such programs. In a separate stimulus effort, President Obama on Saturday announced nearly $2 billion in loan guarantees for solar energy production. Through the PACE program, loans to install solar panels and make other energy improvements would be repaid through 20-year special assessments on property tax bills and secured through a lien. On May 5, Fannie Mae and Freddie Mac, which buy and resell most home mortgages, notified lenders that such liens could not take priority over a mortgage but did not offer guidance on how to handle such loans. The uncertainty has frozen many PACE programs and led some energy companies to furlough workers. On Friday, Cathy Zoi, an assistant secretary at the Energy Department, called officials in Boulder County, Colo., to inform them that the administration had been unable to persuade the Federal Housing Finance Agency, which oversees Fannie Mae and Freddie Mac, to accept mortgages with PACE liens. The liens, like other property tax assessments, would be paid first if a homeowner defaults. “She said in light of the circumstances we should look at other ways of financing energy efficiency with the stimulus money,” said Ben Pearlman, a commissioner in Boulder County. Those homeowners who already carry energy liens on their property may find it difficult to refinance their mortgages. In Sonoma County, Calif., some lenders have declined to issue new loans for homes with such liens unless the assessment is paid off. Ms. Zoi also called Cisco DeVries, president of Renewable Funding, a company in Oakland, Calif., that devises and administers PACE programs for local governments. “She indicated that the agencies had decided not to accept the liens and the administration needed to begin contingency planning on what to do with stimulus funding allocated for PACE,” Mr. DeVries said. Dan Leistikow, the Energy Department’s director for public affairs, confirmed the calls. “We expect to get more written guidance from the regulators this week,” he said on Saturday. In Thursday’s New York Times, I write about how government-chartered mortgage giants Fannie Mae and Freddie Mac are derailing an innovative program called Property Assessed Clean Energy. PACE programs finance the installation of solar panels and energy efficiency upgrades and let homeowners repay the loans through a 20-year surcharge on their property tax bills. SAN FRANCISCO — The Obama administration is devoting $150 million in stimulus money for programs that help homeowners install solar panels and other energy improvements, which they pay for over time on their property tax bills. At the same time, the two government-chartered agencies that buy and resell most home mortgages are threatening to derail the effort by warning that they might not accept loans for homes that take advantage of the special financing. The mixed messages have alarmed state officials and prompted many local governments to freeze their programs, which have been hailed as an innovative way to help homeowners afford the retrofitting of a house with solar panels, which can cost $30,000 or more before incentives. “The thing that is maddening is that this is having a real-life impact with companies laying off people and homeowners in limbo as all these projects are stalled,” said Clifford Rechtschaffen, a special assistant attorney general in California. The technique, known as Property Assessed Clean Energy, or PACE, was pioneered by Berkeley, Calif., in 2008, and 22 states have authorized such programs, which are intended to make it easier and cheaper for homeowners to invest in energy efficiency. So far, only a few thousand people have used them. But the Energy Department wants to promote the programs — and give an economic boost to companies that install energy systems — through the $150 million in stimulus funds, which are intended to help communities cover setup and administrative costs. Fannie Mae and Freddie Mac, the government entities that guarantee more than half of the residential mortgages in the United States, have different priorities. They are worried that taxpayers will end up as losers if a homeowner defaults on a mortgage on a home that uses such creative financing. Typically, property taxes must be paid first from any proceeds on a foreclosed home. In letters sent to mortgage lenders on May 5, Fannie Mae and Freddie Mac stated that energy-efficiency liens could not take priority over a mortgage. “The purpose of this industry letter is to remind seller/servicers that an energy-related lien may not be senior to any mortgage delivered to Freddie Mac,” wrote Patricia J. McClung, a Freddie Mac executive. However, the agencies did not offer guidance to mortgage lenders on how to handle properties that carry the energy liens. Backers of the programs fear that mortgage lenders, who depend on Fannie and Freddie to buy their home loans, will now start demanding that the entire lien be paid off before issuing a new loan. That is what happened to Deke DeKay of Healdsburg, Calif., when he sold a house in nearby Geyserville in May. Mr. DeKay, who had purchased the foreclosed home as an investment, put in new insulation and heating and cooling systems, financed by $11,000 from Sonoma County’s program. Now Mr. DeKay is worried about his own home, which carries a $25,500 lien for a five-kilowatt solar array installed last year. “If we ever want to refinance the house, it will be impossible for us to do that,” he said.